A rich new world has opened up. Resources are plentiful, the economy is booming, and the capitol city of this new world is expanding like never before! Even though many corporations scramble to stake a claim in the exploding prosperity, only one can claim ownership! Who will take over the Infinite City? Will you place the capitol next to the port, claiming both as your own? Will you use the transit station to move another player’s military base out of the way, or place your embassy to steal his temple? Will you try for a greater area under your control, or move to capture key buildings? Infinite City is a stand alone tile game where players become the leaders of corporations building an ever-sprawling city, maneuvering to control the largest districts while holding on to the most valuable buildings. Infinite City is a decently fun tile game where you are expanding a city and the pieces you control. If you can expand your control and capture enough pieces of the city then you will rule Infinite City BWAHAHAHAHAAAAA! Ok, it’s a pretty fun game, but I don’t know if its Bwahaha fun. The game is pretty simple, but still has a surprising amount of strategy and forward thinking involved. I consider this a big plus. Gameplay starts with four face down tiles to start the city and you will play your tiles in turn face up. When you place a tile, it must go next to an adjacent tile and you would usually place one of your colored markers showing that you control this tile of the city. Each tile has its own special ability that will allow you to influence the city in some way. For instance, the stadium tile works in a way that it draws in the adjacent tile’s player markers on to its own. Similarly working with the idea of a crowd of people heading to the game at the stadium. Each of the cards are similar to this. They have some different type of a city such as a port, library, police station and so forth. When you play these different tiles they will affect the board in a fashion after which they were named such as the stadium does. Construction Site: Place one more tile. Library: Look at the top five deck tiles and take one of them into your hand. Embassy: All tiles must be played adjacent to this tile as long as possible. Hopefully you can see some how the tiles interact and work with the theme of the game being with you building a city. To score you must have at least a connection of three adjacent tiles with your occupying token on them. As you advance through the game the tiles and tokens are moved around quite a bit by yourself and by other players so strategy is a good part of scoring. You can also score by playing certain tiles that have bonus points on them. The good features of this game is that is fast, cheap, and has a great amount of strategy considering how basic it is. This fact alone makes this a good game in my opinion. It is a great game to pull out to fill a short hole. It has bascailly no set up and you are good to go right from opening that box. The instructions are basically do what the tile says, anyone can play it. The bad features would be that there is a lot of backstabbing. You could start your turn building off of the tile you just played and have your next three turns lined out only to have that base tile moved to a completely part of the city by the time it gets back to you. In this sense your strategy will be changing a lot. You know the gamer who whines and complains when someone puts the robber on his tile, you’ll want to kill him before the end of the game. Overall I really like the game. It’s a good thing the price is low, because with such a basic game I would have a hard time paying much for it. One thing I do believe, too much of this game would wear on me. Which, being a short game is easy to do, but it is well made, good strategy needed, and fills a need. That scores high in my book. 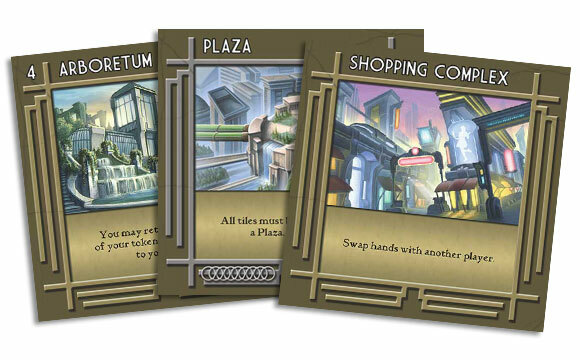 Infinite City is an elegant tile-laying game in which planning and cunning are rewarded. The game starts with five tiles lying upside down in a cross shape and every player getting five tiles. Every turn a player may lay a tile connecting to the sides of existing tiles. This player places a token of his or her color on it. After that the text in the tile is put into effect, which may move tiles around, shift tokens or even take away existing tiles. Points are scored by having districts (connecting tiles [non-diagonal!] with your tokens on it, with a minimum of 3), having tokens on tiles with points and having the most tokens on special tiles (a chain symbol is at the bottom: only the one with the most special tiles gets these points). This score is tallied after the last token of any player has been put on a tile and everyone else has had an extra turn. The rules are simple, but the strategy comes in with planning your moves. Some tiles like Housing, Library or Construction Site make it possible to play more tiles after the one just played. Getting a good sequence going and thus building districts that are hard to reach for other players may insure winning. I liked this game a lot. You have to think about your moves carefully, work with the tiles you are given and you have to watch what your opponents are doing. If someone gets ahead you have to thwart their plans, while at the same time getting out of this with more points. Even so, games don’t last very long, so you can easily play it when you have some time to spare, but aren’t in for a very long game. I broke out my copy of Infinite City recently for the first time in over a year. I had played it at GenCon 2010 but had not gotten it to the table since. I was teaching it to a pair of moderately experienced gamers at a local event. I had forgotten how much fun this was. The fairly simple mechanism of tile placement gets completely skewed my the variable powers that come in to play with each move. The abilities of the tile just played can redistribute the field of play in unexpected ways. A careful study of the options for placement and the use of the power is called for if you don’t want to find yourself in a very poor position. (This is what happened to me.) The ease of the rules explanation make this a good introductory game with just enough complexity to keep experienced gamers coming back for another go. Most every week these days, the game group has something new to try. Last night it was Infinite City, and very enjoyable. The components are top-notch, the artwork nice, the instructions quite clear and simple. As one plays through it the first time, it doesn’t take long to realize the value of position and placement. Fast, simple, and fun – this looks to me to be a great candidate for a “gateway” game. Personally, I think it would have been cool to go just a little more towards the Fritz Lang / Metropolis / Gotham look. And I think it would be nice to introduce a little more movement into the game – a bit more “this-will-be-valuable-later” on the tiles. That said, I’ve no complaints — it’s definitely a game to keep near the front of the shelf and bring it out for the family gatherings. Infinite City is a tile placement game wherein players take turns placing new portions of the city, the tiles, while claiming some control of the city. Initial play seems very simple and straight forward, but attentive players will find unexpected uses for some tiles. One of my least favorite tiles initially has become my favorite to play, especially in larger games. Game play can be pretty fast and allow for multiple games in a single night without the game becoming stale. Had fun learning, simple concept from devious players. Make sure to read the rules YOURSELF before commencing the game with harden players…lol. Lots of, ” oh, and by the way this card can do…(fill in the blank)”, especially after playing the Capital card. It was fun to see how someone who started out strong was scattered all over the playing field by the end of the game (by me, who never takes kindly to only partial information for a first time playing of a game). I would love to have this as an app. Anyone know if it is in the works? Add a Review for "Infinite City"